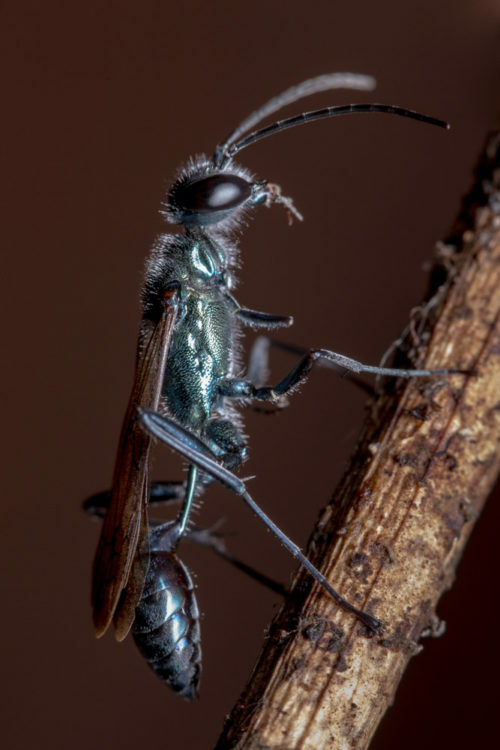 I found a bunch of Blue Mud Dauber wasps in my garden sleeping on a dry vine. 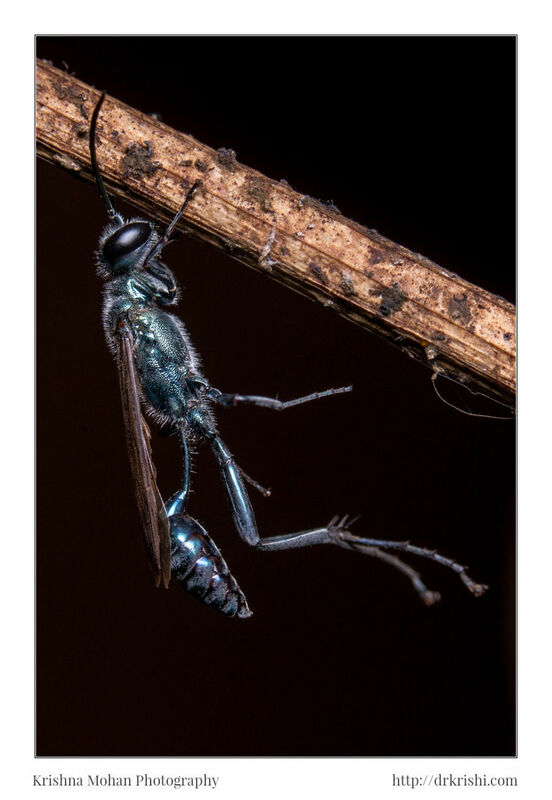 These Blue Mud Daubers, Chalybion bengalense are pretty common blue household wasps we encounter at home. 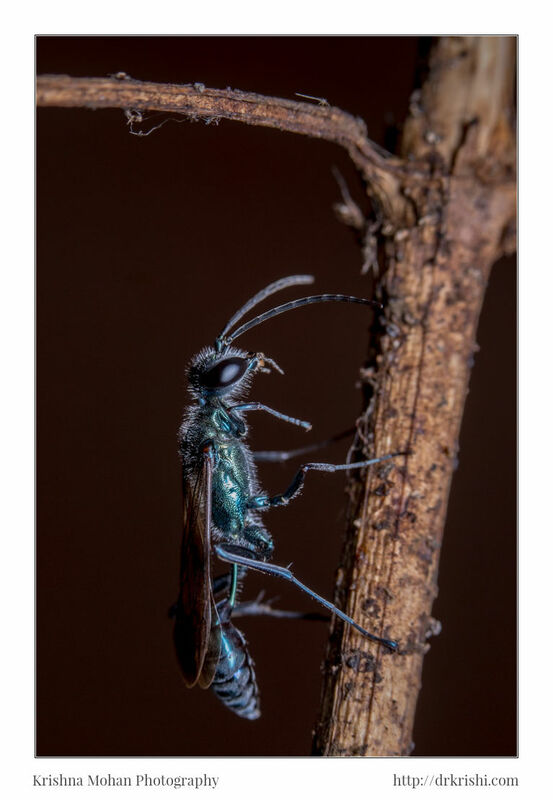 Even though these are solitary wasps, males have a habit of sleeping in a group together. I was using my Canon EOS 5D Mark III with Canon EF 100mm f/2.8L Macro IS USM. For illumination, I setup 80cm softbox with Godox Ving V860c E-TTL Li-ion Camera Flash. Using wireless trigger on hot-shoe I was able to control the flash. This allowed me to control the flash both in intensity as well as direction. Since the wasps were immobile and sleepy, I had quite a bit of freedom to move around them and capture them effectively, provided, I don’t disturb them. 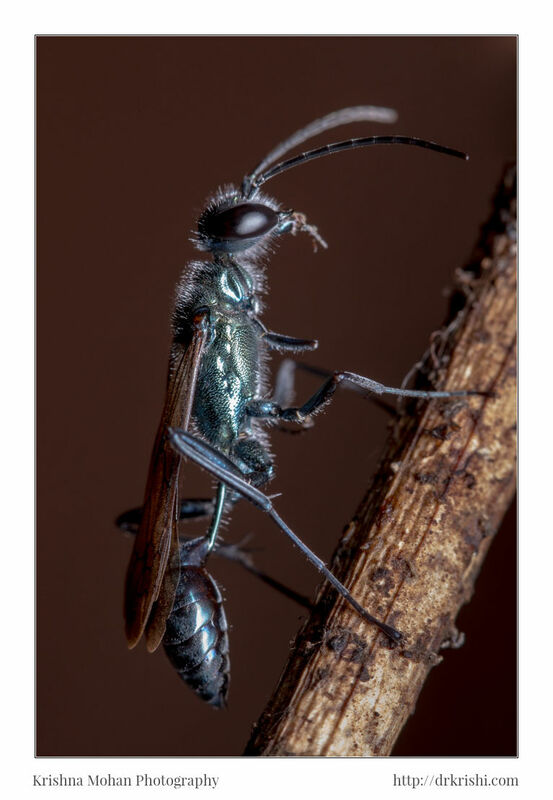 The blue mud dauber wasp Chalybion bengalense (Dahl-bom, 1845) is perhaps the most widespread species of the genus. It has been recorded from the Eastern coasts of Africa, the Sinai Peninsula, Oman and Iraq, eastward through India, China, Japan, Indonesia and the Philippi-nes, to New Guinea and Australia. Throughout this range, the species is also known from most islands and archipels in the Indian and the Pacific oceans. Very recently, moreover, C. ben-galense has been found also in Florida, U.S.A. 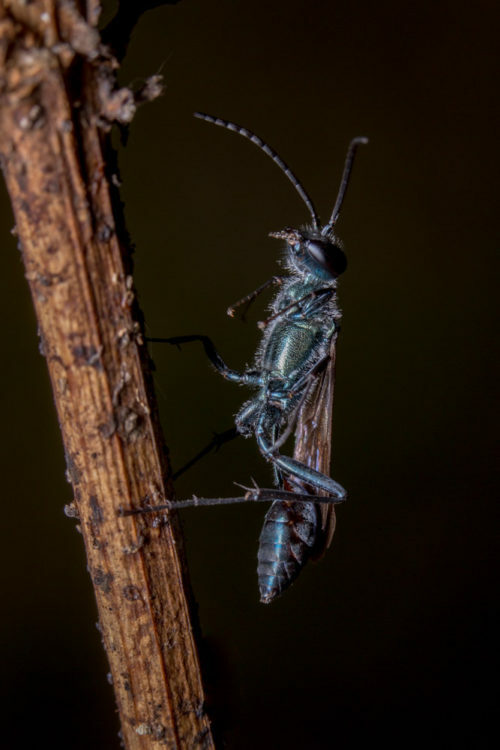 This wasp belongs to a group of mud daubers who are solitary wasps in the family Sphecidae. 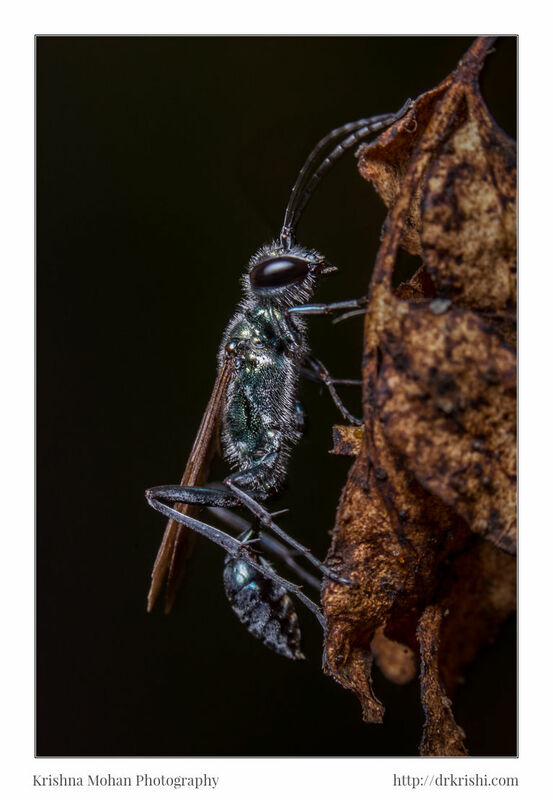 Chalybion bengalense, Females take over abandoned nests of other species of Mud Daubers like their cousin Black & yellow mud daubers. 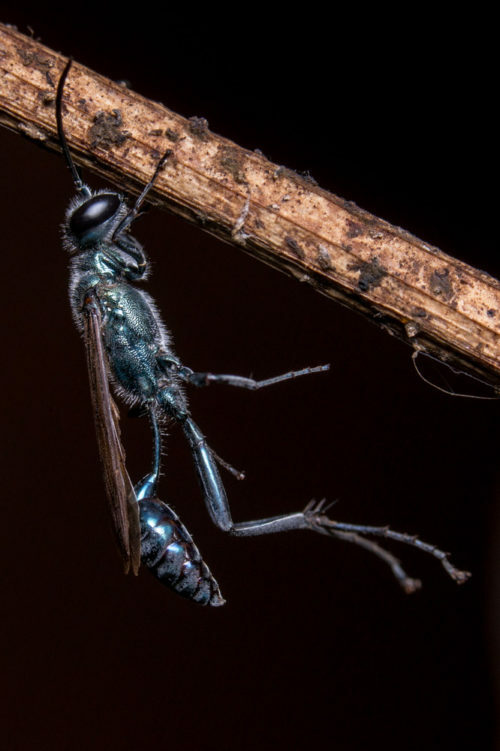 Like the other species of the genus whose habits are known, this wasp nests in preexistent cavities, very often vacated nests of other mud-dauber wasps and bees, and hunts spiders to provision the cells. Chalybion makes up for any engineering deficiencies with a persistent, clever, and energetic approach to catching prey. 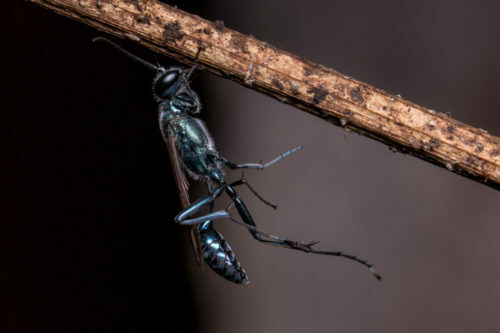 The female wasp is able to land on a spider web without getting entangled, then do a convincing impression of an insect that is in distress. She plucks the web and draws the spider out. The poor arachnid comes dashing down a thread expecting dinner and instead seals its own doom. 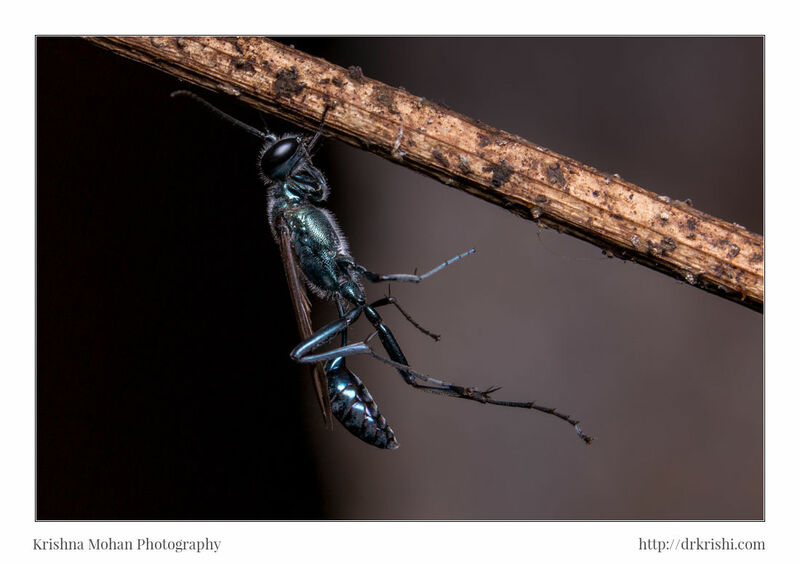 The blue mud dauber stings the spider into paralysis and flies it off to her nest. Spider hosts include mostly other cobweb weavers, family Theridiidae, small orb weavers (Araneidae), and the odd lynx spider (Oxyopidae), crab spider (Thomisidae), or jumping spider (Salticidae). Mud daubers in general stuff a multitude of spider victims into each mud cell before finally sealing it with a curtain of mud. A single egg had been laid on the very first spider stored at the bottom of the cell. The wasp larva that hatches then gradually consumes all the spiders, leaving a smattering of legs as the only indication there was ever anything else in there with them. The mature larva then spins a paper like silken cocoon inside which it pupates. 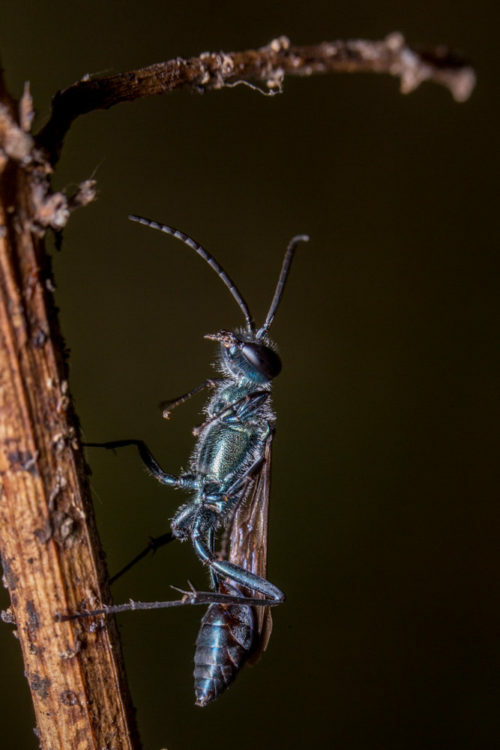 A few weeks later an adult wasp chews a round hole in the end of the cell and exits. Holes in any other part of the mud nest indicate that some kind of wasp parasite chewed its way to freedom instead of the mud dauber. 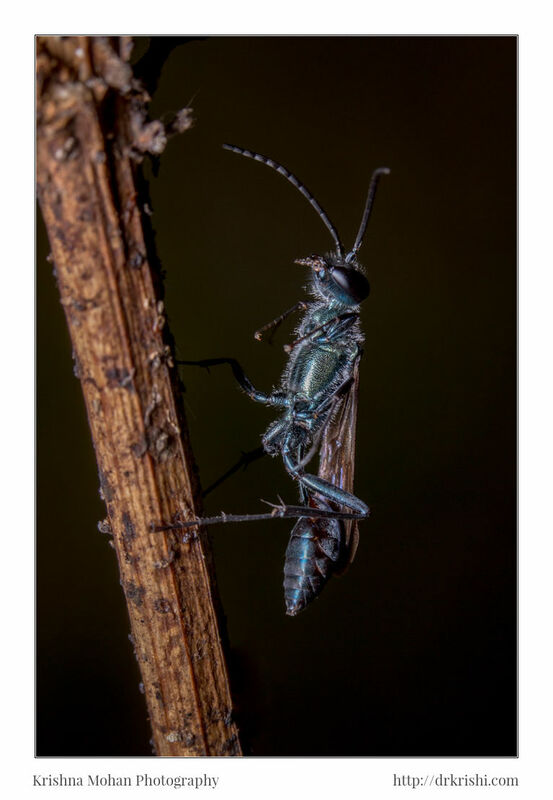 Male mud daubers are far less industrious than their female counterparts. Their sole mission is to father the next generation. Meanwhile, they are content to sip nectar from flowers or extrafloral nectarines. They also like oozing sap from wounded trees and, perhaps most of all, the honeydew secreted by aphids and scale insects. 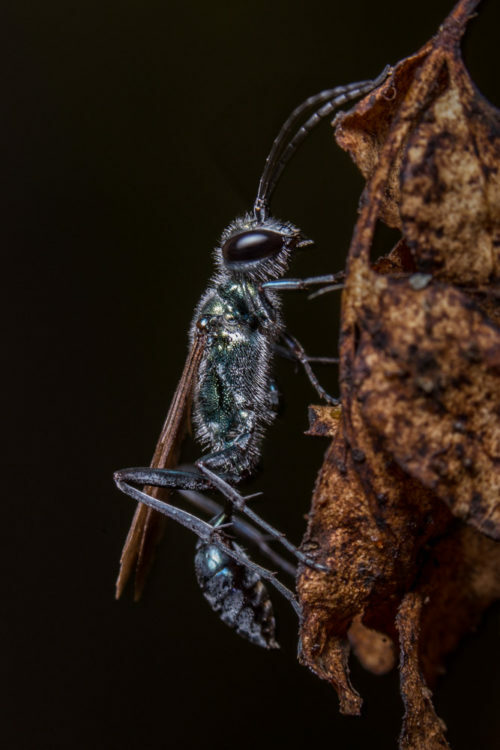 Both genders of mud daubers like this delicacy, which is nothing more than the sugary liquid waste produced by those sap-sucking buggers. Meanwhile, after a heavy day of drinking, males may gather in bachelor parties to sleep it off during the night. 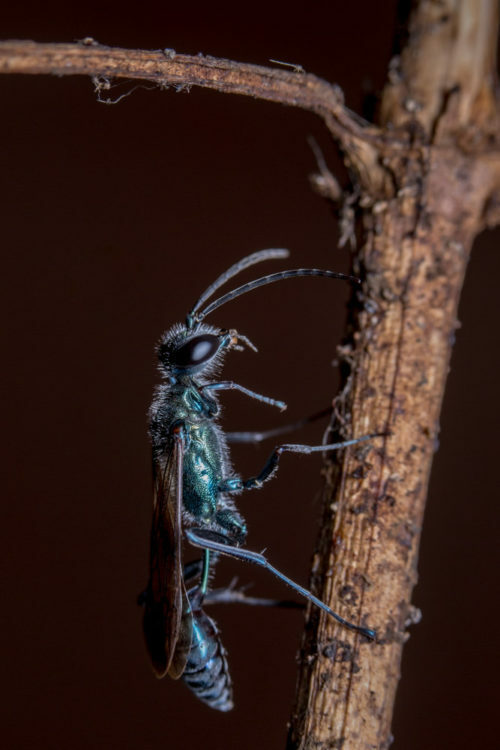 These congregations of normally solitary wasps can cause a bit of anxiety in people who confront them. All the wasps in picture today are in such a post drinking slumber and are resting on a dry vine in my garden in a slumber party. There were 14 of them in one vine. Enjoy making your own observations of these wasps. They are not the least bit aggressive and, because they often nest on the exterior of buildings, are easy to watch. EXIF info - Aperture : ƒ/13 | Camera : Canon EOS 5D Mark III | Taken : 15 March, 2015 | Flash fired : no | Focal length : 100mm | ISO : 100 | Shutter speed : 1/80s | Images and content Copyright © Krishna Mohan. Please contact me to purchase prints or for image publication license. EXIF info - Aperture : ƒ/10 | Camera : Canon EOS 5D Mark III | Taken : 15 March, 2015 | Flash fired : no | Focal length : 100mm | ISO : 100 | Shutter speed : 1/80s | Images and content Copyright © Krishna Mohan. Please contact me to purchase prints or for image publication license. EXIF info - Aperture : ƒ/9 | Camera : Canon EOS 5D Mark III | Taken : 15 March, 2015 | Flash fired : no | Focal length : 100mm | ISO : 800 | Shutter speed : 1/40s | Images and content Copyright © Krishna Mohan. Please contact me to purchase prints or for image publication license. EXIF info - Aperture : ƒ/9 | Camera : Canon EOS 5D Mark III | Taken : 15 March, 2015 | Flash fired : no | Focal length : 100mm | ISO : 200 | Shutter speed : 1/40s | Images and content Copyright © Krishna Mohan. Please contact me to purchase prints or for image publication license. EXIF info - Aperture : ƒ/11 | Camera : Canon EOS 5D Mark III | Taken : 15 March, 2015 | Flash fired : no | Focal length : 100mm | ISO : 400 | Shutter speed : 1/40s | Images and content Copyright © Krishna Mohan. Please contact me to purchase prints or for image publication license. Wow, What a work and description, I have never seen photographer take time to write all details. Hat’s off. One of the Best Works, I have Ever Seen in my Life. 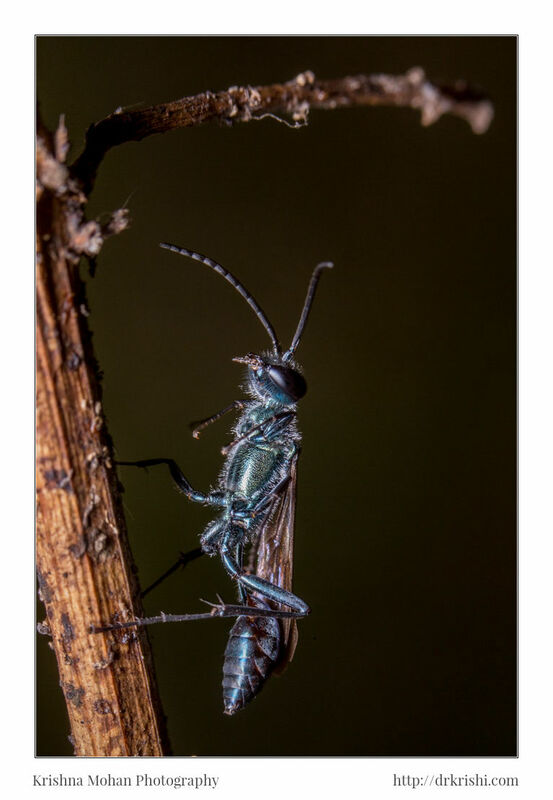 I discovered your website a few minutes ago while searching for the name of a blue wasp I encountered when out on an afternoon walk. I find insects fascinating, thank you for all the amazing photography that you have shared. P.S. sorry if this gets posted twice, I am not sure if my first comment got through. We found one of these meandering through the forest floor here in TN . When we observed it closely it actually “played dead ” and secreted a yellow liquid . How bazaar ! As soon as we left it alone it continued on it’s merry way .